These were growing in what you might call a hostile environment. A sand and gravel bank created by glacial deposit doesn’t provide much to live on. About the only thing living on this landscape was moss and lichens. The moss was bone dry after a prolonged ‘drought’ and I could both hear and feel it crunch under my moccasins. How alive the moss is could be debated but there were hints of green here and there. I’m sure it will revive after it cools down and we get some decent rain. I know of no other area like this when it comes to matchstick lichens. Usually I find them here and there, never in such great numbers and covering so large a space as I found them here. I actually has to watch my step to keep from stepping on them. Several scattered pieces of dry wood had lichens growing on them but I found only one that rated on my cuteness scale. 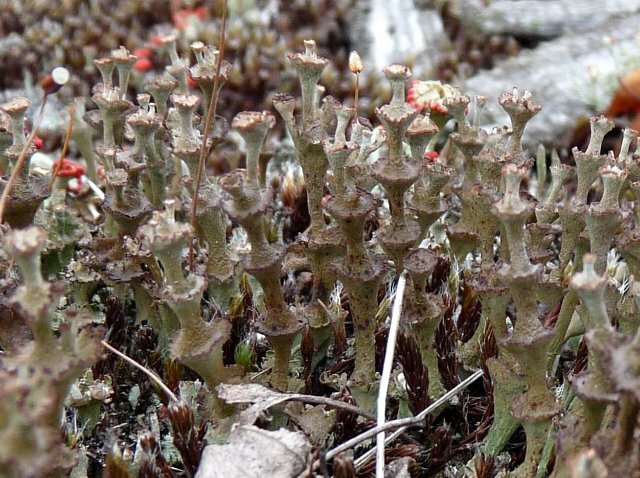 A bit of deer moss (really a lichen – Cladonia sp.) 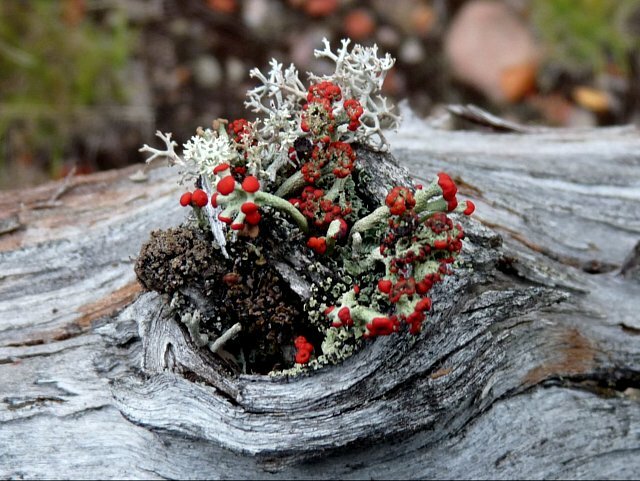 growing alongside the matchsticks in a knothole created a cute mini garden that looks like it came from another planet. How cool is that? A handful of garden that I don’t have to weed. All I need to do is place in where it will get plenty of sun and clean air. I’m thinking of transplanting another mysterious (I have no clue of the name) lichen to make the garden even more alien looking. They look like tiered fountains to me. Now all I have to do is figure out how to drill a hole through the ‘stems’ and find a really teeny tiny fountain pump and I’m in business. 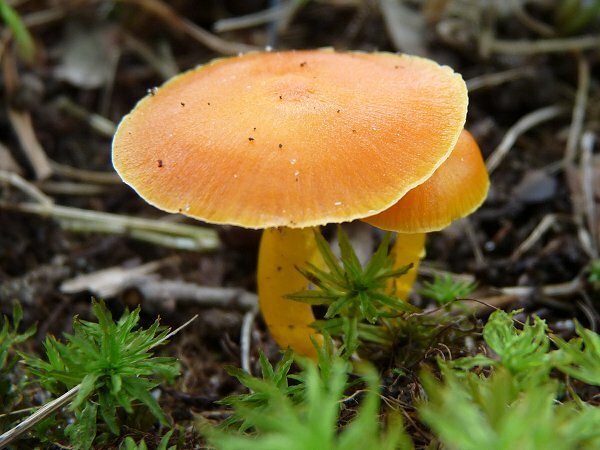 I’d consider harvesting some of these for arts and crafts people that create Fairy Habitats but do not want to destroy the only colony on this planet known to me. I almost always neglect to say where I find the subjects in my photos. 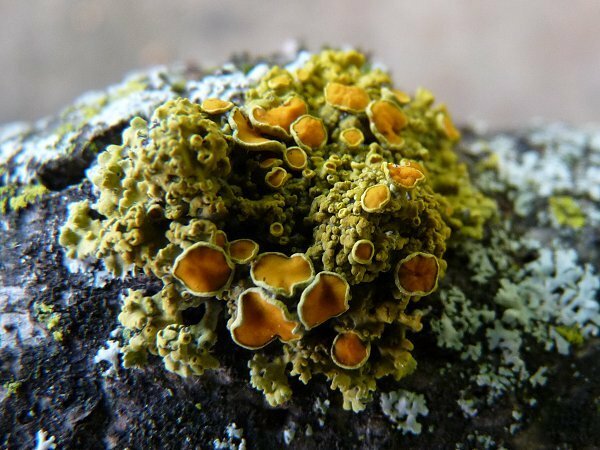 Today I’ll show ya where I found some nice lichen to photograph. Living in a rural area means the wild things are right in my ‘backyard’. Of course my backyard includes a neighbor’s farm consisting of wet woods, crop fields and swamps bordered by the Grasse River. Finding something interesting is no harder than wandering around in the hundreds of acres behind my house. When that’s not enough there are thousands of acres of ‘wild’ land within a short drive. Being a ‘stone’s throw’ north of the Adirondacks does have some advantages. Dog and I checked out a rock pile in one of the crop fields out back. Old rock piles in a sunny location are a great place to seek lichens. Advantage mine – air quality is excellent (lichens need clean air) and piles of rock are left undisturbed for generations. Look beyond the ‘new’ pile of rocks to see a ‘mature’ tree covered rock pile. Rock islands like this are a common sight in north country fields. As expected, there were numerous colonies of lichens growing on the rocks and the conditions just right for erecting reproductive structures. 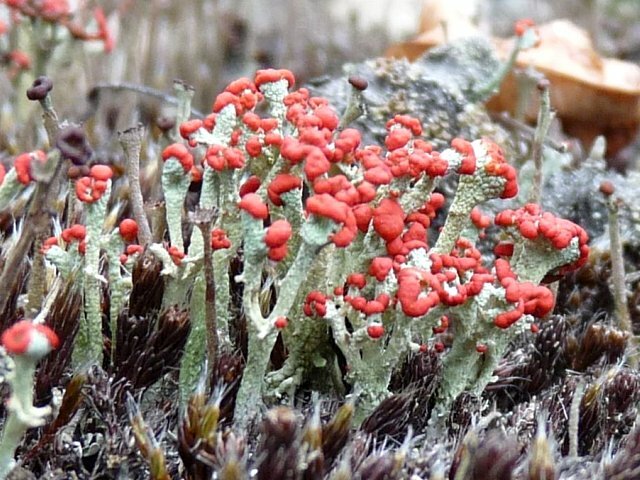 Pixie Cup Lichen – Cladonia sp. I’m not going to argue over the common name but these things look more like wind instruments belonging to a pixie land brass band. I ain’t whistling pixie, that red bug is a Red Bug. If you need to know more you can Google, chigger. While you do that, I’ll go walk naked through one of those car washes with the big spinning brushes, get a full body-wax and then just to make sure there’s nothing up my sleeve, burn my clothes. I already know more than I want to. Actually I’m not worried, I see a lot of chiggers but have never had one dine on me, thank goodness. 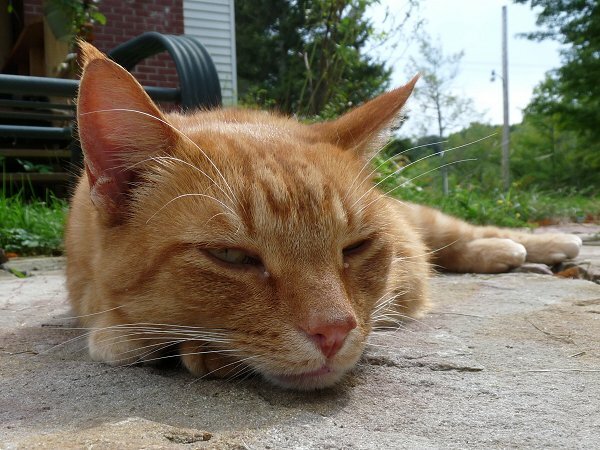 Pookey started it all. She had to go out and she wouldn’t go without me. With looks like that, how can I resist. …and that’s not even close to her sad face. Here’s she’s just a bit upset because Stewy followed us. 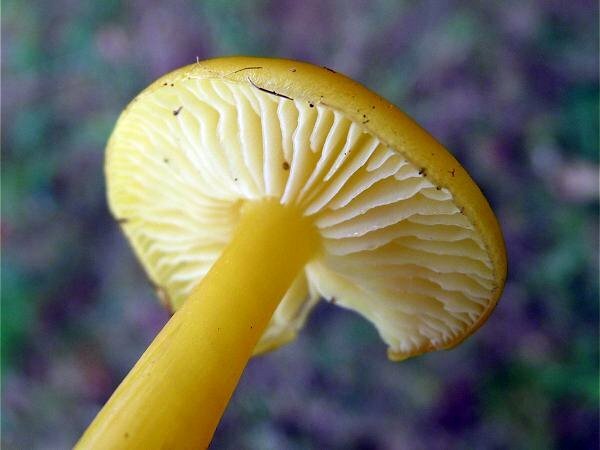 Knowing it takes lab tests and DNA comparisions to properly identify Hygrocybe species makes me feel better. I get so discombobulated attempting to identify mushrooms I almost don’t want to photograph them. Yet I do and then spend way too much time trying to identify something like this one. 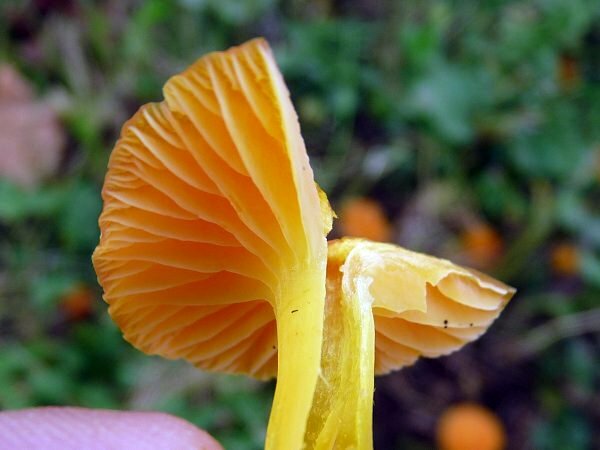 This orange waxy cap was growing only a few feet away from the yellow ones. It looked like two distinct colonies of fungi but from what I’ve read it wouldn’t surprise me if they were all the same. 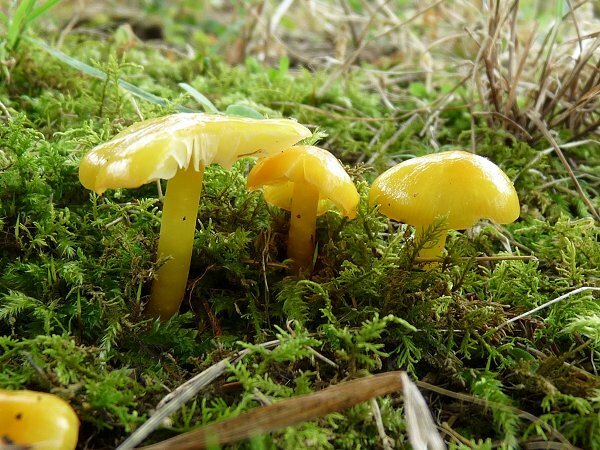 If not it’s still most likely to be another Hygrocybe species. All I really know is that it’s yellow, foliose and shouldn’t be growing on my finger like that. 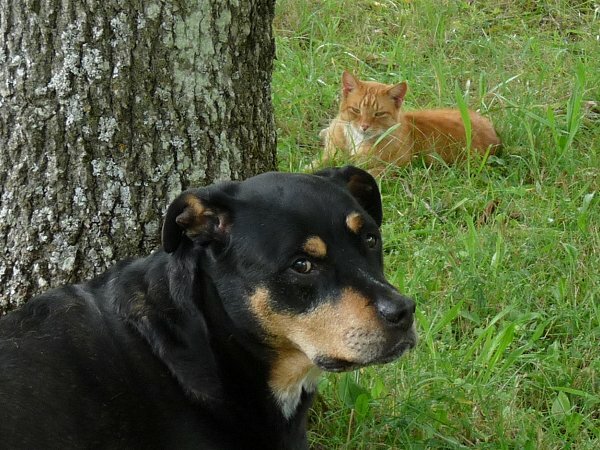 We circled the yard stopping often while I took photographs. Dog got bored and left but Stewy stuck with me the whole time no matter how boring it got being with me.